"What keeps me going is empowering community members to share their own stories and speak out..."
Hey, everybody! You know what time it is. Time to check in and meet the Angry Reader of the Week, spotlighting you, the very special readers of this website. Over the years, I've been able to connect with a lot of cool folks, and this is a way of showing some appreciation and attention to the people who help make this blog what it is. This week's Angry Reader is Cassie Chinn. I'm 4th generation Chinese American. On my dad's side, my great grandfather worked as a cook along the railroad in Eastern Washington. My grandmother and grandfather were born in Seattle – my grandfather right in Canton Alley in the Chinatown-International District. 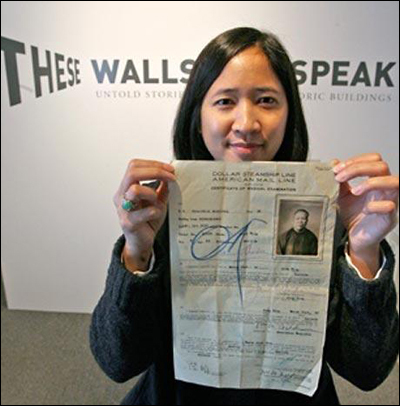 On my mom's side, if it wasn't for the Chinese Exclusion Act, I would be 5th generation. My great great grandfather mined in Montana, and my great grandfather farmed in California. They were never allowed to bring a wife from China and start a family here. My grandfather eventually came to Seattle in 1939 to work in the canneries; he served in the U.S. Navy during World War II, and was finally able to bring his wife to America under the War Brides Act. Right now, I'm sitting at my desk on the 3rd floor of the East Kong Yick Building, a historic hotel built as the core of Seattle's Chinatown in 1910. It was renovated as the Wing Luke Museum of the Asian Pacific American Experience (The Wing) in 2008. We're the only pan-Asian Pacific American museum in the nation, and the first affiliate of the Smithsonian Institution in the Pacific Northwest. Last year, we were named an Affiliated Area of the National Park Service. Our namesake Wing Luke was the first Asian American elected to public office in the Pacific Northwest. He served on Seattle's City Council from 1962 to 1965; he was passionate about bridging cultures, and fought for social justice and historic preservation. We carry out those core values today. I'm born and raised in Seattle, living on Beacon Hill, just a mile from where I grew up. When Seattle finally made red-lining illegal, many Asian Americans moved to Beacon Hill, just south of the Chinatown-International District. Here at The Wing, we don't have curators on staff; instead, we work hand-in-hand with community members to create their own exhibitions. We're in the final stages of installing a new exhibition on Bruce Lee, called "Do You Know Bruce? (opens Saturday, October 4). I worked with community members to develop the main messages, themes and storyline of the exhibition. They really wanted it to be an intimate, personal portrayal of Bruce, rooted here in his Seattle story. The exhibition begins with a pilgrimage to his gravesite in Seattle's Lake View Cemetery. It then traces his Seattle journey – from Ruby Chow's Restaurant to the Chinatown-International District to the University of Washington. From there, we follow his story in California and beyond through rare Kato memorabilia and film collectibles. The exhibition then wraps around full-circle, with first-hand reflections from his wife Linda on why she chose Seattle for his final resting place. It's been amazing to work with the Bruce Lee Family and Foundation and collectors like Perry Lee to bring this show to life. After working at The Wing for over 20 years, what keeps me going is empowering community members to share their own stories and speak out on issues that they are passionate about. It's also amazing to be a part of people connecting across generations. We're actively keeping culture alive here at the Museum, and I'm energized by the dynamic, organic, evolving nature of that work. I'm also committed to doing what I can to help preserve and revitalize the Chinatown-International District. We inherit a legacy of social activism from leaders before us who fought for the rights and livelihood of residents, business owners and community members in our neighborhood -- and it's our responsibility to continue that work today. Decades of public works projects -- from the I-5 freeway to multiple stadiums and more -- in Seattle that have impacted the growth and vitality of the Chinatown-International District, time and time again. Long-held stereotypes of Asian Pacific Americans that continue to be perpetuated. A broken immigration system that keeps families separated and deports young Asian Americans to countries that they have never known.